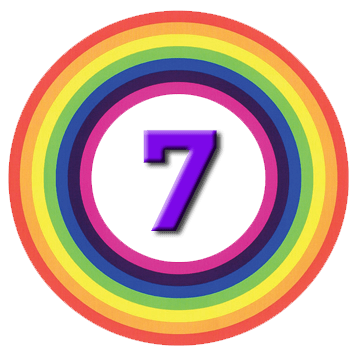 This post is part of a series on Warren Buffett's Annual Letters to Shareholders of Berkshire Hathaway. Links to all the articles - plus a selection of Warren's best quotes - can be found here. We’ve previously looked at Warren Buffett’s letters that cover 2016, 2015, 2014, 2013, 2012, 2011, 2010, 2009 and 2008. Today we’ll examine the 2017 letter, which was published over the weekend. 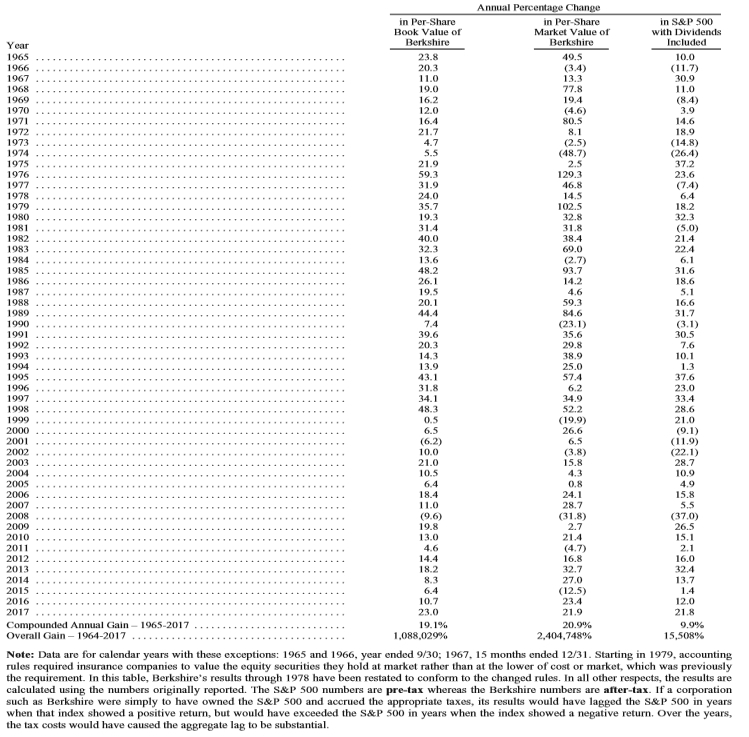 The letter begins with a table of Berkshire Hathaway’s annual performance versus the S&P 500. The table dates back to 1965. Over this period of 53 years, Berkshire Hathaway (BH) has compounded its book value at 19.1% pa. The BH share price has increased by 20.9%. By comparison, the S&P 500 has “only” increased by 9.9% pa. The S&P 500 numbers are pre-tax whereas the Berkshire numbers are after-tax. If a corporation such as Berkshire were simply to have owned the S&P 500 and accrued the appropriate taxes, its results would have lagged the S&P 500 in years when that index showed a positive return, but would have exceeded the S&P 500 in years when the index showed a negative return. Over the years, the tax costs would have caused the aggregate lag to be substantial. BH gained $65.3 bn in 2017 (23%). Per share book value is up from $19 in 1965 to $211,750 at the end of 2017. Only $36 billion came from Berkshire’s operations. The remaining $29 billion was delivered to us in December when Congress rewrote the U.S. Tax Code. The new rule says that the net change in unrealized investment gains and losses in stocks we hold must be included in all net income figures we report to you. Heinz), and the value of these holdings can easily swing by $10 billion or more within a quarterly reporting period. Including gyrations of that magnitude in reported net income will swamp the truly important numbers that describe our operating performance. For analytical purposes, Berkshire’s “bottom-line” will be useless. Buffett has long been critical of a rule that makes BH include realised gains (and losses) in their net income. This new rule will make things much worse, and though BH will explain its own results carefully, Buffett does not trust the rest of the media to do the same. At Berkshire what counts most are increases in our normalized per-share earning power. That metric is what Charlie Munger, my long-time partner, and I focus on ­ and we hope that you do, too. The last point has proved a problem in 2017. Buffet puts the “purchasing frenzy” down to CEOs being “can do” types, with an action bias. Investment bankers, smelling huge fees, will be applauding as well. The availability of very cheap debt is another factor. Even a high-priced deal will usually boost per-share earnings if it is debt-financed. factor in, nor do we often find, synergies. The only significant purchase in 2017 was a 39% interest in Pilot Flying J “the nation’s leading travel-center operator”. This appears to mean petrol stations, or rather truck stops. BH ownership of the company will increase to 80% in 2023. There have also been bolt-on acquisitions to Clayton Homes, Shaw industries (floor coverings) Home Services (real estate brokerage) and Precision Castparts. Buffett cautions that float comes with risk, and that the “catastrophe light” period of recent years will not last forever. 2017 was the first time in 15 years that BH made an underwriting loss. They took 3% of industry losses, reducing their net worth by 1%. But BH is better-prepared for a possible $400 bn “mega-cat” (something Buffett estimates has a 2% probability) than any other insurance company. Regular readers will know that Buffett’s letters usually work through all of BH’s operations in some detail. But now Buffett has decided that this is both repetitous and also duplicative of information included in BH’s 10-K submission. Other operations delivered $20 bn of pre-tax income, an increase of $0.95 bn over 2016. About 44% of the 2017 profit came from two subsidiaries: BNSF, our railroad, and Berkshire Hathaway Energy (of which we own 90.2%). Marmon and Precision Castparts) delivered $5.5 bn (up from $5.4 bn in 2016). The next five (Forest River, Johns Manville, MiTek, Shaw and TTI) earned $2.1 bn, up from $1.7 bn. The rest returned $3.7 bn (up from $3.5 bn). Depreciation was $7.6 bn and cap ex was $11.5 bn. Kraft Heinz is excluded since Berkshire is part of the control group for that firm. BH’s shares had a cost valuation of $9.8 bn, or $17.6 bn under GAAP rules. The shares were worth $25.3 bn at year end. Buffet uses this section to once again stress the randomness of stock valuations (which must now be included as part of BH income). This table offers the strongest argument I can muster against ever using borrowed money to own stocks.There is simply no telling how far stocks can fall in a short period. Regular readers will be aware that Buffett made a 10-year bet with a hedge funder that the S&P 500 would outperform a portfolio of hedge funds. 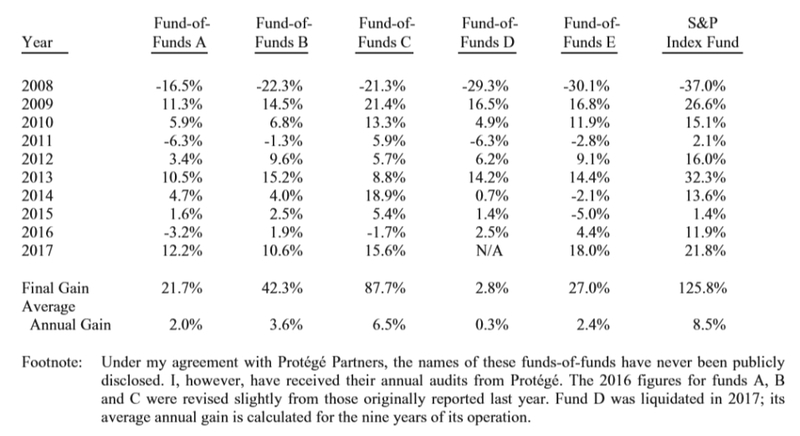 The five funds of funds chosen by Protege Partners included more than 200 underlying hedge funds. The funds beat the S&P on the way down (2008) then lagged it for all nine subsequent recovery years. Publicize my conviction that­ a virtually cost-free investment in an unmanaged S&P 500 index fund ­ would deliver better results than those achieved by most investment professionals, however well-regarded and incentivized those “helpers” may be. Buffet notes that even if the hedge funds lost money, their managers would become very rich. Fixed fees were an average of 2½% pa.
Buffett and Protege each funded their half of the $1M bet by buying $318K of zero-coupon US Treasury bonds. They were bought at 64 cents on the dollar, to mature at $500K. That’s a 4.6% pa return over the life of the bond. But by 2012 they were trading at 96% of full value, with a projected yield to maturity of 0.9%. So both Buffett and Protege swapped the bonds for shares in BH. It should be noted that Buffett underwrote that the BH shares would be worth at least $1M at the end of 2017. Buffet notes that investment is the foregoing of consumption today to allow greater consumption tomorrow. “Risk” is the possibility that this objective won’t be attained. By that standard, purportedly “risk-free” long-term bonds in 2012 were a far riskier investment than a long-term investment in common stocks. Often, high-grade bonds in an investment portfolio increase its risk. (95.7 sale price/.88 yield), those being “earnings” that could not increase during the ensuing five years. The Trump tax cuts have given BH a $29 bn boost in earnings this year. Stocks are expensive, hence BH has made few acquisitions this year. BH now has a $116 bn war chest to spend on the right deal. Bonds are even more expensive and, of the two, Buffett prefers stocks for the long run. Buffett is not a fan of the high fees charged by most fund managers. He uses high fees to partially explain why he won the bet against the hedge funds. It’s worth noting however that BH itself would also have failed to beat the S&P 500 over the same time period. He doesn’t believe in investors using leverage. Note that in a sense, BH does use leverage, in the form of the insurance float. Hi Mike…. Buffet is such an investing genius….and I love how he took on the Hedge Funds with a bet and won! Thanks for sharing the summary! I hate to admit this, but I have yet to sit down and read the annual letter. 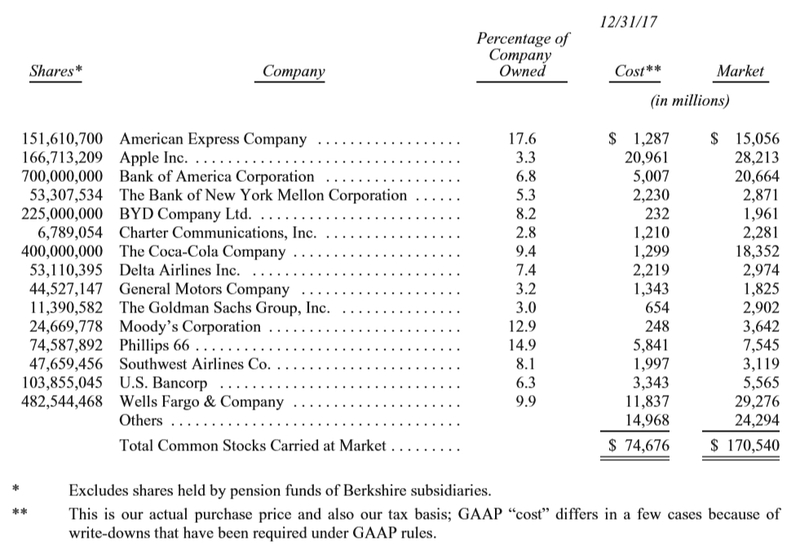 I do know that these changes in GAAP are going to be even more misleading for a company like Berkshire. Changes like these can help those who understand how to look through a non-GAAP lens. But it is going to be very misleading when reading their financials as long as these rules stay in effect for Berkshire. Thanks for writing! Is it a good idea for a UK citizen to hold Berkshire Harhaway ‘B’ shares. What are the pros and cons involved. It’s not really possible to answer that question for you since every investor’s situation is different. What do you hope to achieve with your portfolio, and how do you think that BRK.B would help? After that, things get personal, and we’d need to know more about things like your current and target net worth, your time horizon and your risk tolerance. Passive investing works fine for most people, and with active investing, your edge is normally limited to your home country – though the US is probably the easiest foreign market to trade. I’m thinking of putting the maximum amount into shares ISAs before I retire in twelve years time. I thought BH ‘B’ shares would give me a diverse investment. BRK.B shares do offer some diversification, if we assume that your other shares ISAs are invested in UK stocks. But diversification is easy and cheap to achieve through UK-listed ETFs and investment trusts, and you might want to investigate these before looking at overseas stocks. Please can you give me some suggestions for ETFs and Investment Trusts both UK and/or overseas that I can consider.